Find out the list of current affairs quiz articles created from the events happened during the last week of February 2017. 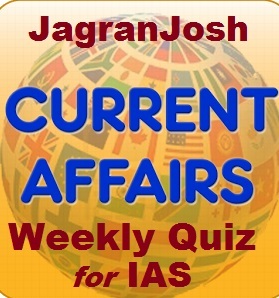 Various important events happened in India and around the world have been covered in the current affairs quizzes form. Such questions with explanation are very important for IAS Prelims Exam 2017. It is very important to understand the essence of the current affair in every stage of IAS Exam. Now, the current affair has become one of the essential parts of the IAS Prelims Exam and it must be studied by an IAS aspirant on a priority basis. The application form for the IAS Prelims Exam 2017 has been released which is to be held on 18th June 2017. The IAS aspirants have to be very selective while doing study during the last leg of preparation for IAS Prelims Exam 2017. The importance of current affairs in IAS Exam has already been discussed in previous write-ups. It has been found that from the last few years of IAS Prelims Exams, the frequency of asking questions in the current affairs section has been increased and consequently, now the current affairs have become one of the core subjects to study for IAS Prelims Exam as well as for UPSC IAS Mains Exam. Here in this write-up, we have provided a set of articles consist of current affairs quizzes created from the events happened in the last few days. We have covered the significant events of national and international importance in quiz form and the questions are completely based on the pattern of UPSC IAS Exam. Practicing such IAS questions will help IAS aspirants to gain a momentum in their preparation of UPSC IAS Exam. In this article we have covered the topics like- the Hydro Electric Project in Nepal, the two critically endangered impatiens plant species, a bilateral cooperation through cinema with Ukraine, the illegal trade and export of tortoises and freshwater turtles (TFT) and India’s first heliport in Delhi. In this article we have covered the topics like- the scheme ‘Hamari Dharohar’, 6-kilometer-long Bet Dwarka Darshan Circuit, the 22nd state to join the UDAY scheme, the Social Security Agreement (SSA) and a multi-pronged policy framework to promote living close to mass urban transit corridors. In this article we have covered the topics like- Arun-3 Hydro Electric Project in Nepal by SJVN Limited, the Solar Parks and Ultra Mega Solar Power Projects, new frog species belonging to the genus Nyctibatrachus, level of pollution in Indian cities and the Navy’s Surface Surveillance Radar (SSR) project. In this article we have covered the topics like- a soft loan of USD 340 million to Nepal, the Nepal Infrastructure Summit 2017, Memorandum of Cooperation between India and Japan, the NITI Aayog’s two incentive schemes for digital payment, the Pradhan Mantri Awas Yojana (Urban) and characteristics of graphene. In this article we have covered the topics like- the Zealandia, Barren Island, he Rotavirus vaccine under its Universal Immunization Programme (UIP), New Marriage Bill and the GST compensation law. In this article we have covered the topics like- 2017 Index of Economic Freedom, WHO NRA Global Benchmarking Tool (GBT), first Indian all women circumnavigation of the globe expedition of the Indian Navy, Indian Coast Guard Ship ICGS AYUSH and the GSLV MkIII rocket.